SEOUL: North Korea held mass celebrations for its latest successful long-range missile test, Pyongyang’s state media said Saturday, with the regime accusing Washington of “begging for nuclear war” over planned military drills, reports AFP. 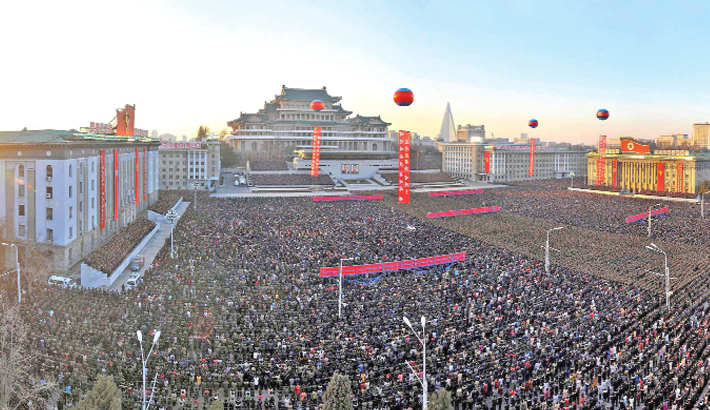 To celebrate the missile launch the ruling Workers Party’s official daily Rodong Sinmun covered its front page with colour photographs showing thousands of tightly packed soldiers and people applauding in Pyongyang’s Kim Il-Sung square, which was decorated with large portraits of the North’s late leaders. “We heartily celebrate the successful test launch of the Hwasong-15 which showed Chosun (North Korea)’s power and greatness to the whole world”, read one banner held up by the crowd, referring to the missile. The US in response warned that Kim Jong-Un’s regime would be “utterly destroyed” if its pursuit of a long-range nuclear missile arsenal provokes a military clash. Washington is battling to maintain international solidarity in the face of the North nuclear threat after Russia warned that sanctions have failed and China side-stepped talk of an oil embargo. On Saturday Russia’s Foreign Affairs Minister Sergei Lavrov reiterated his country’s condemnation of the missile test. However, he added: “It is impossible for us not to condemn the provocations by our American colleagues. And, much to our regret, that they try to pull the Japanese and the South Koreans in the same direction.